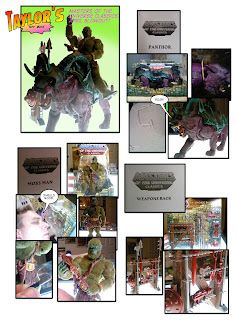 Taylor's Sweet Little Art and Nerd Site: Taylor's Toy Box Review: Matty Collector April Spring Fling Purchase Sting! Taylor's Toy Box Review: Matty Collector April Spring Fling Purchase Sting! What an awesome April at mattycollector! So, if you know me from the "We're not Fanboys" podcast on itunes, or you know of me from the comic book illustration sites, xenexthebugman, unstoppablecomic, or taylorlymbery.com, then you might know that I am a big Masters of the Universe fan. 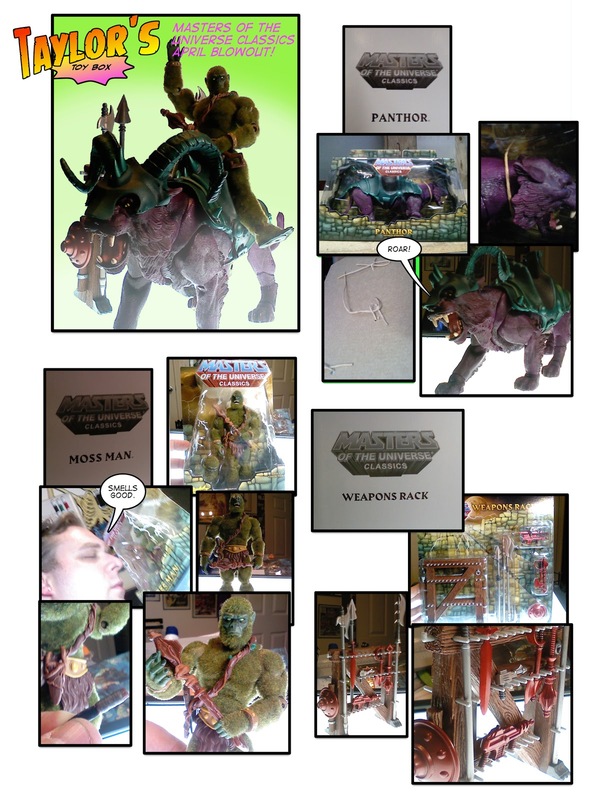 This month (April) I was able to purchase the new and cool, Panthor and weapons rack, and was also able to get the re-issue of Mossman. All three pieces are extremely cool! So, I'll break down each one individually. Panthor- So Panthor is the fifth creature to be released in the ever cool Masters of the Universe Classics line. He is Skeletor's purple cat (see above pic). What a great piece! His body is a reissue of Battle Cat's body, with the exception of the face. I am impressed with the sculpting of Panthor's face verses that of Battle Cat's; loads different in appearance. The saddle is a reuse of Battlecat's as well, just now with a metallic green paint job. So, what makes this cat great since the only new part is the face? Well...it's the helmet. For the first time ever, Panthor has a helmet, and it fits his personality very well, as you can see from the pics above. One thing to look out for, Mattel recently talked of having more environment friendly packing techniques. I believe Panthor is the first to utilize this. Instead of wire wraps, he is bound to the box by bailing string. Kudos to Mattel for trying out something new, like... going slightly... green. Now my cat did not come with toe nail paint on his right front paw. That's ok, he is still very cool, but that is something to look out for if you are able to get one off of ebay, or it re-releases. Panthor sold for the first time on mattycollector.com, April 15th 2011 for $30.00, and he's worth every penny. Great piece. Weapons Rack- Now, I have to start by saying, this piece has no moving parts or articulation. It is a simple weapon rack, but a great looking piece. So this ten piece toy, in my opinion, is a must have for the Classics line collector. It you take your figures out and pose them, and you have the Grayskull stands, there is no reason you should not have this piece. What I really like about this is that it is set up to look like the original weapons rack that came with Castle Grayskull. Obviously, this one is bigger than the original and has a better paint job. But, this time, the pegs are not a part of the toys initially pressing. Let me explain. The pegs on the original were molded onto a fragile piece of orange plastic. This one's pegs are seperate. Saying that, the pegs on this new piece have less chance of breaking off. So, if you look at the pic above, you will notice that some of the weapons are red. This is paying homage to Man-E-Faces with weapons pack that released back in the 80's. I do have a couple of let downs. First some of the rust red paint did come off of a ray gun onto the package. Just be aware, if you get this, some paint might come off. Second is that the small ray gun, and the small axe, do not fit on the rack very well, or at least, I haven't found a good way to put them on there. I will have to admit, for $12.00 I feel that this piece is well worth the money. It looks great with the MOTUC figures and stands. Mossman- Ok, so the last piece is Mossman without ear flocking. Mossman is a re-issue. The package actually came with a white mailer box, and has "the original" stamping on the internal packaging (that states that it is a second run toy). I had been hoping that Mattel would re-release this guy... I had really been hoping, and oh is He great! Overall, the flocking of "moss" on him is well done, covering his body in most of its entirety, and yet giving room for his joints to move. I love that this time he has a vine sling or side pack with a knife that comes out, verses the 200X figure and the Original figure. His body is a re-issue of Beastman's with a new head and assesories. Now his vintage head is the same mold as Beastman's MOTUC head, but his other interchangable head is a new sculpt by the Four Horsemen Toys. It is based on the design of the 200X Mossman in the comic and the TV series. I love the new head over the vintage, by the way, This is a piece I am glad to have been able to get the re-release of. So, all three pieces in my opinion are extremely good. I did miss Sy-Klone, but I might get him if they re-release him. I would say that I think April has been the best month for the MOTUC roster on mattycollector. I know Panthor sold out in a matter of 2 hours ( I'm glad I got mine). The other Masters items dragged through the rest of the day, but eventually sold out. Right now, now the only places to get these items are from online toy stores, ebay, and amazon.